The brand-new Biketown system in Portland, Ore., is already taking off, and a tour of its offerings shows a unique system that improves the transportation options of locals and visitors alike. It’s great for transportation geeks because it automatically provides detailed data about one’s rides. It’s great for those who want to sightsee because stations are already plentiful. And it’s great for those new to bicycling because it’s designed to be safe and simple. Sure, there are still a few hiccups in the 1,000-bike system, which opened two weeks ago. But several rides I took recently throughout the downtown and across the bridges of the Willamette River while visiting for the Association of Commuter Transportation annual conference proved to reinforce Portland’s status as a top bicycling city in the U.S.
Generally speaking, Portland’s drivers proved less aggressive than back home in Washington, D.C. (not that they’re especially bad in the District’s urban core, where many have learned to share the road as bicycles became a more regular sight in recent years). Of course, with Biketown’s blaring orange paint job, it would be pretty impossible for a motorist to not see one. Another benefit of the color is that it’s easy to find a neon orange station as riders look to park their bikes. What differentiates Portland’s system from bikeshare in similarly-sized cities is that it follows a “smart-bike” model, rather than a “smart-dock” one, meaning the technology to check out bikes, log rides, and display information is all attached to the bike’s rear fender. Previously, smaller cities and campuses (see: College Park, Md.) have opted for smart-bikes, while larger urban areas (Seattle, Boston, New York, D.C.) have installed smart-dock systems. Signing up is easy, but requires a tiny bit of forethought: I filled out a form online in about two minutes and reserved a bike down the street. To unlock it, I just punched in my membership number and PIN in the on-bike electronic system and was off on my way. A rare hiccup: a rider forgot to take their U-lock while biking. On the hiccup side was that a fair number of bikes were in repair mode and unavailable for use, although the easy digital readout on the back of the bike made it clear that this was the case. I also used a bike in which the seat kept falling down and a few I used had glitch-y gears, which could be the result of the bikes having eight speeds, unlike Capital Bikeshare’s three. As a first-time user, I didn’t initially realize that I could self-report repairs at the end of my rides, and clearly many other users are also not yet aware of this feature. The price is certainly right and is competitive with other forms of transit. The $2.50, 30-minute single ride or $12 day pass options (which can, important to know, only be used for a total of three hours over a 24-hour period) gives tourists some nice options, while locals can buy annual passes for $12 a month. Annual passes provide users with 90 minutes of ride time across unlimited trips, each day. 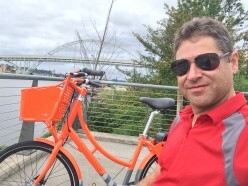 Biketown opened July 19, and “ridership so far is stronger than expected,” according to Dani Simons, director of communications & external affairs for Motivate, the system’s operator. 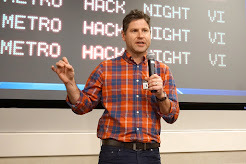 Ryan Rzepecki – founder of Social Bicycles, who provided the technology and design behind the system’s smart-bikes – noted during the Mobility Lab-sponsored Transportation Techies special Portland edition that there have been 28,351 total trips in Biketown’s first two weeks, an average of about 2,000 trips per day. Mobility Lab: Looking beyond these first couple of weeks, what will be considered success for Biketown? Simons: Success will be continued strong ridership and also getting folks who have never tried biking, or have never tried it beyond recreational biking, to give it a whirl. What do you think was the secret to getting the city and Nike to embrace just doing it, meaning putting the system in? The City of Portland has wanted a bikeshare system for some time now. But they wanted to get it right. Patience means they get a system where the taxpayers bear no ongoing risk for operations and one with a proven operator in Motivate, and a world-class partner in Nike. What are the top keys to getting people to use the system? First, good station planning (making sure stations are in locations where people want and/or need to go). Second, a few different membership types that meet a variety of needs (including a single-ride pass that encourages new people to try bikeshare on the spur-of-the-moment), and lastly, providing great service. Is there anything exciting or unique about Biketown’s marketing and communications strategy to get people to try riding? Right now we’re focused on building a brand that is fun, easy, accessible, and authentically Portland. I think the Biketown Instagram feed is a great example of that. Also, across all Motivate-operated systems, we’re focused on building strong member communications that welcome, educate, and engage members, to encourage folks to make the most of their memberships, and we hope, over time, renew. With GPS on each bike, it shouldn’t be long before we see some detailed looks at exactly how Biketown is taking off in Portland. While some questions remain to be seen (will monetary rebalancing incentives ease the cost of moving bikes around? ), it seems poised to become a key element of Portland’s already-famous bike infrastructure. Photos: Top, a Biketown hub in the Pearl District (Adam Russell). Middle, an abandoned U-lock at a hub in downtown Portland (Adam Russell). Bottom, the author at Willamette riverside. Don’t panic and no need to fret, we have technicians minutes away to come directly to get the door opened..
Child locked in the car, this is a serious emergency in the hot vehicle and must be attended to with the fastest service available. locksmithing emergency and we make sure that you are taken care of immediately.